Well, if you are a returning visitor to my website, you probably have noticed a different template design. I was looking to brighten things up a bit, by bringing a clean new style to the website, and found this WordPress template that seemed to be quite versatile in what could be done with it. BlogoLife is a simple and perfect HTML5 & CSS3 theme for personal blogging that supports post formats, and several customization options. The custom background, custom header, and multiple color schemes gives you the possibility to adapt your blog as you wish. With the BlogoLife template, I customized it to the size width that I wanted. Though, I had to do some figuring out the widths in order to create some new graphics for the wider width that I was changing it to. I ended up increasing both the left column (main text area) slightly, and increased the width of the right column significantly to allow for the usage of wider graphics. Prior to using the new template, I decided to upgrade WordPress to the latest and greatest. That was quite a story in itself and required troubleshooting an upgrade that went awry. If using WordPress for your website, I suggest reading about how to recover from a failed WordPress update here. Once I was upgraded with WP and all the Plugins, I tackled the template area. As with any website, there are tons of things behind the scenes, which are not seen by most folks visiting a website. However, if you are a website developer, you know what I am talking about. Spacing, alignment, color, graphics, text size, and even the header and footer spacing is a puzzle with having to make sure all the pieces fit together properly. Everything is looked at with a critical eye (mine), and still there are always things that you want to improve. Then on top of all of that, making sure that Web functionality is still intact, navigation, analytics, and other smaller items of importance such as how the admin area for comments, access, and page and post edits work in conjunction with the template are all inner-linked and functioning well together. So, I hope you like the new design to the website. In this template, you might see some different colors every once in awhile, along with different header images too. Let me know what you think. I remember the days when routers were not even allowed on Comcast. At least that was the official line. Then like everyone else, Comcast realized that was a silly terms of service requirement. Today just about everyone has more than one computer and many folks are running a combination wired and wireless home network to hook up their PC and Apple desktops, laptops, Nintendo Wii, iPads, iPhones, Android phones, and even new high definition flat screen televisions are configured for wireless access for Netflix, Amazon, and other streaming video services. Making the best choice for a wireless router is most important when it comes to making sure all those devices work well for Internet connectivity. Like many of you, I did tons of research on the pros and cons of all the available routers for sale. Trying to decide what is important is difficult when there are so many choices. However, the important stuff to me came down to reliability, cost, signal strength, and ease of use. Like one of the Amazon reviewers stated in the feedback area online, since it is a refurbished unit, they felt that Cisco would have gone completely through it to test everything out. That gave me the confidence on the reliability aspect. Plus, having the backing of the good customer service through Amazon was icing on the cake for peace of mind. Wow, what can you say here! Such a great deal! Why would I want to spend more for a router? Signal strength was part of my criteria for judging the various routers on the market. However, there are many issues which can affect signal performance. Location, location, location is everything. If you place a router behind some shielded wall, signal strength will surfer. Also, depending on the band usage, i.e. 2.4 GHz vs 5 GHz, 2.4 GHz goes further no matter what router you get. Remember, the lower the frequency, the greater the distance given the same power output. I operate exclusively on the 2.4 GHz band. Note that only one band is selectable at a time (which is no big deal in my mind). While the signal strength on the 2.4 GHz might (and I say might) be a little bit less than my old Linksys SRX200, there simply is no comparison as far as the performance is concerned. The Linksys SRX200 was constantly dropping signal. The Cisco Linksys E2000 has never dropped signal on me at all. Let’s face it here. Once you set up the router, how likely are you going to have to keep changing things in the future? However, with that being said, the Linksys SRX200 was a piece of cake to set up. I use the router login through any web browser to set up all routers anyways. No, I did not even insert the setup CD in the computer. So, I can’t tell you how that goes, but from my standpoint, it is simple to login [ http://192.168.1.1 ] to the router IP address through the browser and set up what you want. Refer to getting a new IP address from Comcast for more information on various router brands and accessibility through a browser. 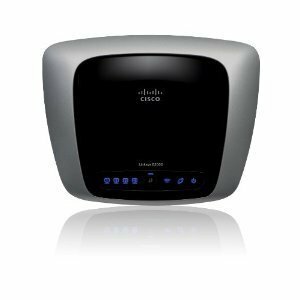 The Cisco E2000 has extended coverage with an additional internal antenna designed for larger homes. Bottom line, it has been working great for a couple of months so far. I am extremely pleased with the performance at this time. Invest in Internet marketing and ethical SEO services today. Get your business website discovered online, acquire quality leads, and gain more sales for your business' products and services.